They're not truffles but kinda, and they're not cookies but kinda. What they are is cute, healthy and delicious treats! 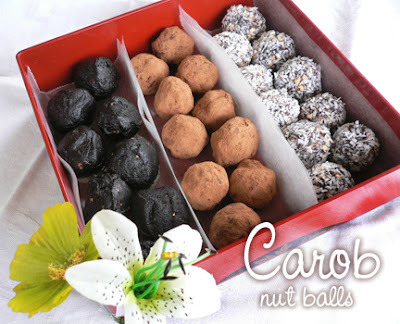 See my article on why I love carob. Thoroughly combine the almond butter, carob powder, cinnamon, honey and vanilla. The dough will be quite stiff. Knead in the nuts and cereal. With wet hands, form into walnut-sized balls. Make sure the surface is glisteningly damp. Choose which coating you'd like to use and roll balls in either coconut, carob ganache, or cocoa/carob powder. Personally, I tried them all, just to see how pretty each variation can be. I found the coconut coating to be the nicest, and easy to coat by shaking the balls in a ziploc bag with the coconut. Refrigerate til firm, or freeze in an air-tight container to store for a week or more. *If you have the option, choose a tiny puffed grain like quinoa or millet. Otherwise, crisp rice will work great, or a flake cereal crushed into smaller bits. If using sweetened cereal, use smaller amount of honey. *Use any seeds or chopped nuts you like, or according to your dosha. I used lightly toasted pecan pieces. 1) Heat an inch of water to boiling in a small pot then reduce to a low simmer. Place 1/2 cup carob chips in another small pot, put this pot on top of the steaming pot, and let melt, uncovered; do not stir until melted. Stir in 2 tsp unsalted margarine or coconut oil plus 2 Tbsp almond or coconut milk, or enough to get the consistency you like. 2) Blend together 3 Tbsp carob powder and 1/4 cup sugar. In a small pot, melt 2 Tbsp unsalted margarine, remove from heat and gradually whisk in carob powder mixture. If it gets too thick, add a small amount of warm 'milk slowly to thin. Adjust with more carob powder if too thin. A mutual friend (Greg) recently introduced me to your site - and I love it. Thanks for sharing your wealth of info on health and great food! I found your blog quite interesting. Did you know that you can shorten your urls with AdFly and earn cash from every visit to your short urls.